redi for Intelligent IT? Let ATSG Transform Your IT Experience! rediCloud, is an enterprise-grade Cloud Service and provides the performance, flexibility, affordability and security for organizations of all sizes. Through our rediManage portfolio for end user support, digital workplace, infrastructure, cloud, mobility, and applications management, ATSG delivers a comprehensive, 24x7x Always managed service. 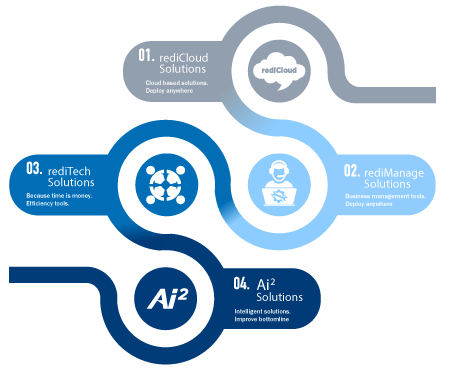 Our rediTech suite of services provide you with the leading-edge applications, tools, infrastructure and resources required to ensure you are operating efficiently and optimized for success. Through our AI2 (ATSG Intelligent IT) platform, ATSG has created an integrated, best in class, IT service management, service operations, and knowledge management solution. Are you redi for Intelligent Solutions to power your business? Today’s fast-paced digital climate requires you to re-evaluate how you conduct your business interactions. With business processes, technologies and systems continuously evolving, you require a partner who is staying on top of the latest trends and can rapidly respond to the demands of the market. It is no longer just the generation of digital disruption; it is the age of digital acceleration where customers demand instant response and uncompromising value. ATSG provides you with the solutions and services platform that is redi for your digital transformation, ensuring an intelligent, automated and secure response along with quality of service for a superior customer experience. Contact us for a quick quote or consultation.